Geometry is useful for more than just passing the sixth grade. In October, I posted on estimation as an essential analytical tool to have today (and more importantly, tomorrow). It’s useful for scheduling, planning, purchasing, and other decision-making circumstances. 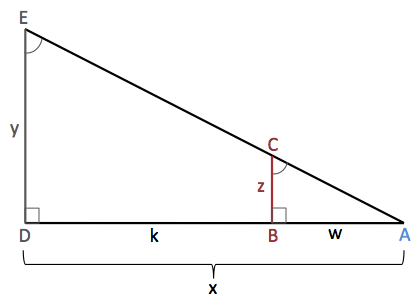 Well here’s a quick and easy geometric technique for estimating the height of very large things. All you need is an intermediate height of reference (perhaps a friend) and your eyes. For this example, I will use a friend as my intermediate point of reference and a large building as the object for which I wish to estimate the height. Line up your friend between you and the building. Your friend should be positioned so that when your eyes (A) are as close as possible to the ground, the top of your friend’s head (C) lines up with the top of the building (E). 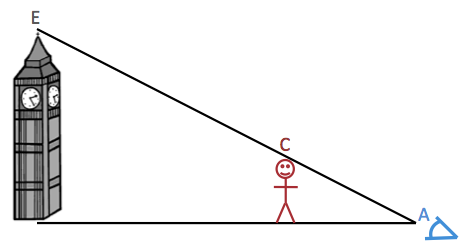 You’re essentially creating the hypotenuse of a large triangle! Now, let’s label and identify the other parts of our picture. Given this picture, geometry tells us that certain relationships exist. NOTE: Be sure to use the same units in your estimations (feet or yards, perhaps) or else your calculation will not work.